Product setup is very straightforward. The setup will install the component, help, demos and sample project files. For Visual Studio 2010-2017 users, products are automatically registered into the Visual Studio toolbox. Visual Studio Express only need to manually add the component to the toolbox after installation. For the purpose of this guide we will assume the VistaSkin.net product is being installed, Begin by running the product setup executable. 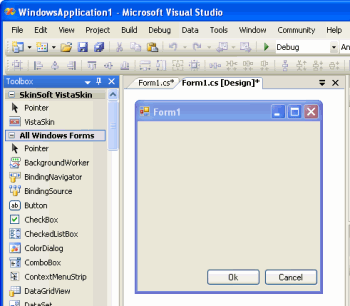 After the setup has completed start Visual Studio and then open or create a new Windows Forms .NET project. Open the main application form in the forms designer, and you will notice a new toolbox tab 'SkinSoft VistaSkin' and component item. 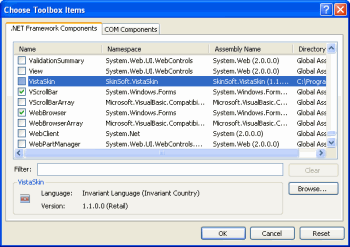 Drag the VistaSkin.Net component onto the form, you will notice the component is placed in the Visual Studio component tray. 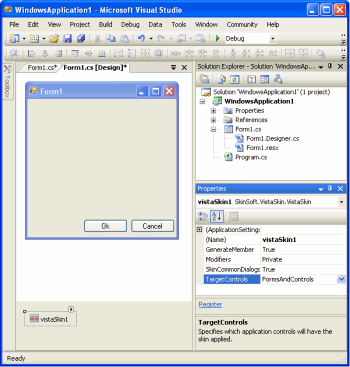 Click on the component and bring up the Visual Studio properties window. You can now customize the component. After installation, you can upgrade to the latest version (if available) at anytime by simply downloading the new version from our website. Visual C# Express, VB.Net Express users can also use our products. After the setup as completed create a new toolbox tab "SkinSoft' then click on the tab to select it, right mouse click and select 'Choose Items'. In the choose items dialog below locate our product in the name column and select it (ensure the checkbox is checked). The component will then be added to the tab you created.